The ?25 million Village Hotel Glasgow opened in July 2015. 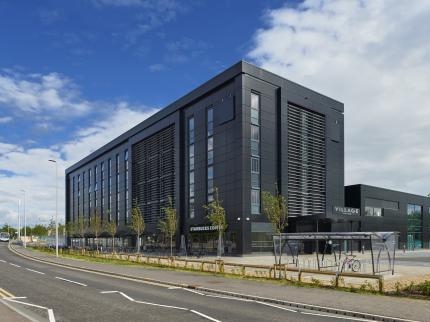 The hotel is in an enviable location near the SECC SSE Hydro Arena and Clyde Auditorium and is just 7 miles from Glasgow International Airport and under 2 miles from Glasgow city centre and train station. Nearby attractions include the Glasgow Science Centre and Buchanan Galleries - a shopaholics dream location. Village Hotel Club offers you everything under one roof: cool room big bed a pool you can swim in a gym and spa you can relax in theatre-style dining and bar a Starbucks and FREE Car Parking. All rooms are uber chic and include FREE Wi-Fi which is also available in all public areas. Why not upgrade to a Club Room - the must-have room with genuinely good extras! Village Gym Entrance Fee: ?5.00 per room per night including access to Health & Fitness Club pool sauna and steam room. Check-in and check-out is done at the self-service kiosks. Enjoy the wonderful amenities and great service at the Village Hotel Glasgow.